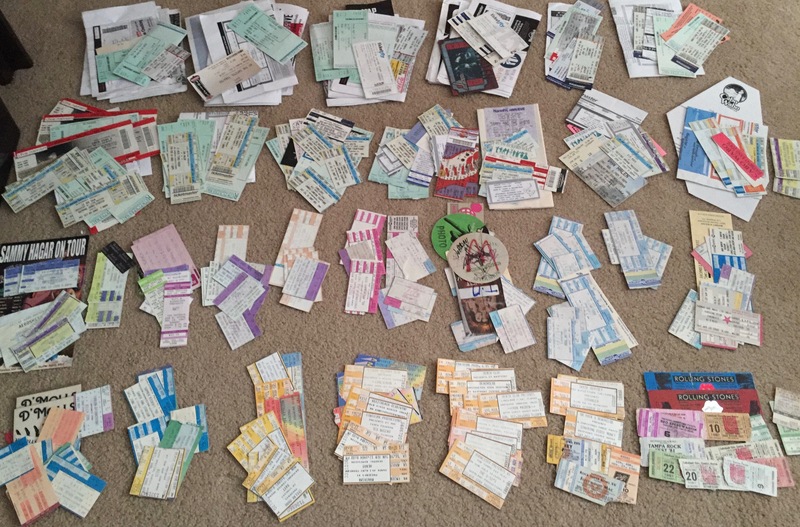 I moved to Los Angeles in April 1986 for several years, so this post includes both Florida and L.A. stubs. Kiss & Wasp, Aerosmith & Ted Nugent, Thrust, Steel Wolf, Great White, Poison & Hurricane & Leatherwolf, Loudness, and CheapTrick. 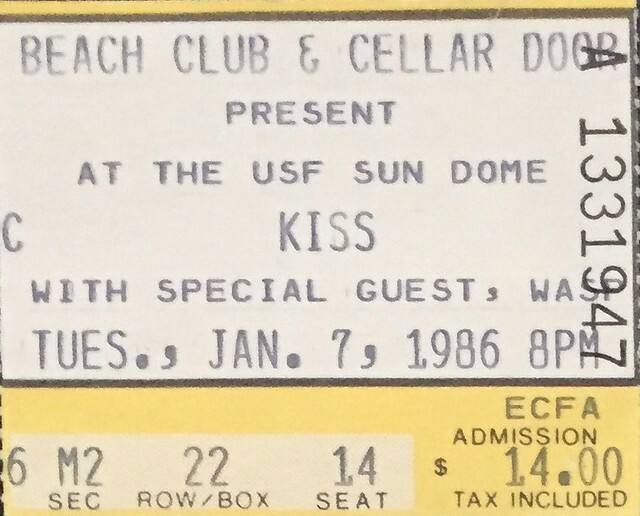 Kiss & Wasp on 1-7-1986 at the USF Sun Dome in Tampa, Florida. Cost $14. 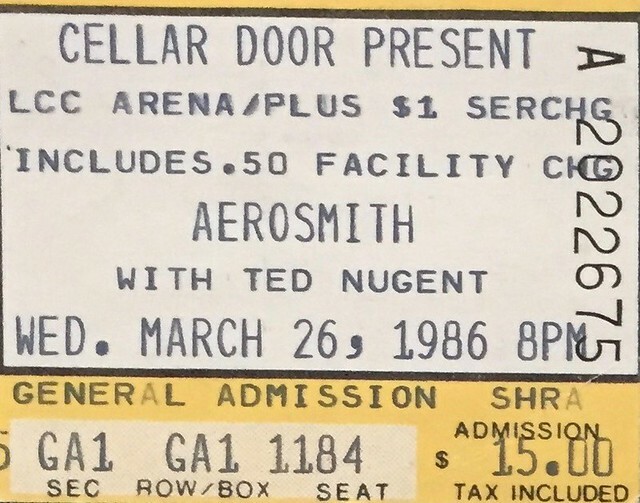 Aerosmith & Ted Nugent on 3-26-1986 at the Lakeland Civic Center Arena in Lakeland, Florida. Cost $15 + $1.50 service charge. Made it back to Los Angeles. Thrust, Steel Wolf, & Rated X on 4-25-1986 at the Country Club in Reseda, California. Cost $6.50. I don’t remember anything about these bands ;o/. 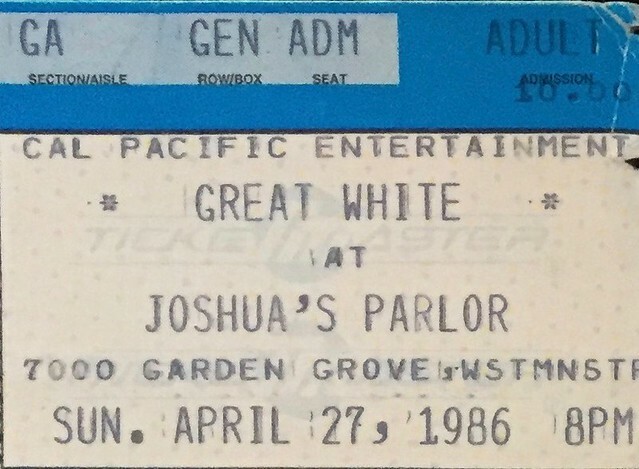 Great White on 4-27-1986 at Joshua’s Parlor in Long Beach, California. Cost $10. Oh how I remember this show. So many things. How no restaurant or gas station or place of business would let us use its restroom on the drive over. The Mascara Incident. Oh, the dancing thing, most of all I can visualize the dancing. Lots of friends, good times, good times. Why I clearly remember so many details of this night is unknown but I am thankful! 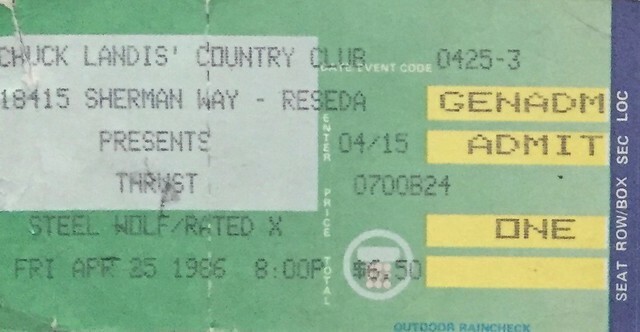 Hurricane – a band we went to see a lot – with Dirty Blonde in May, 1986 at the Country Club in Reseda, California. Cost $8.50. Note of interest: the singer Kelly Hansen does a great job as the singer of Foreigner these days. I have several Hurricane flyers and fan club mailings to post. 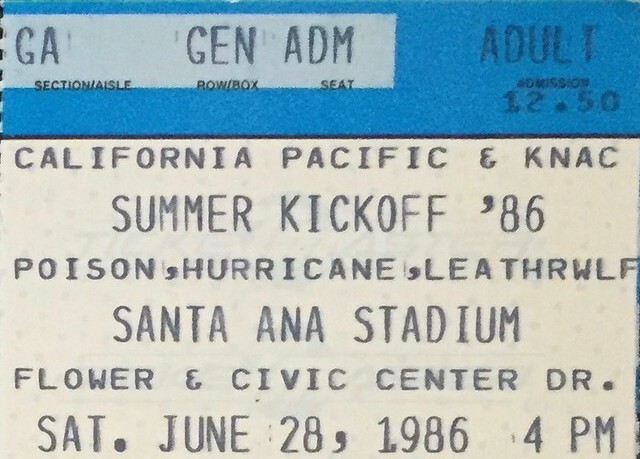 Poison, Hurricane and Leatherwolf on 6-28-1986 at Santa Ana Stadium in Santa Ana, California. Cost $12.50. I also remember some things from this show, ah, beautiful California day. 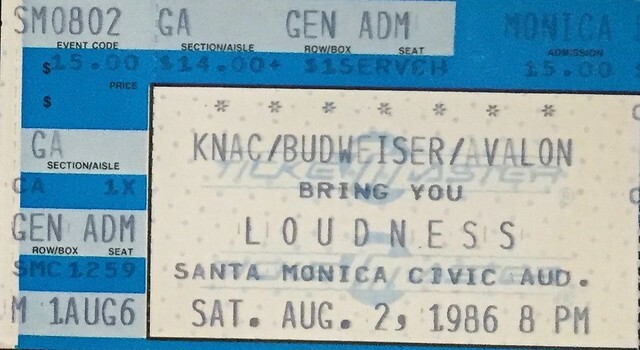 Loudness on 8-2-1986 at the Santa Monica Civic Center in Santa Monica, California. Cost $15. 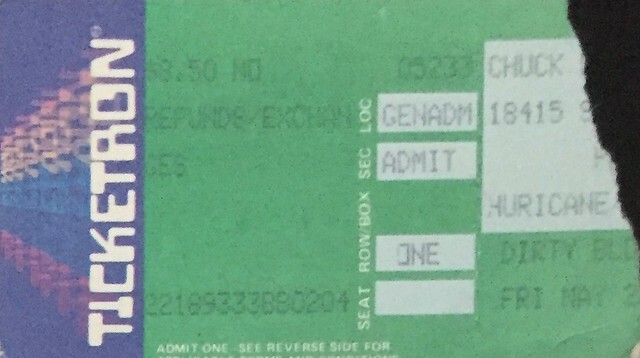 I went and looked up who else played this show, and according to setlist.fm, Poison was also on the bill. 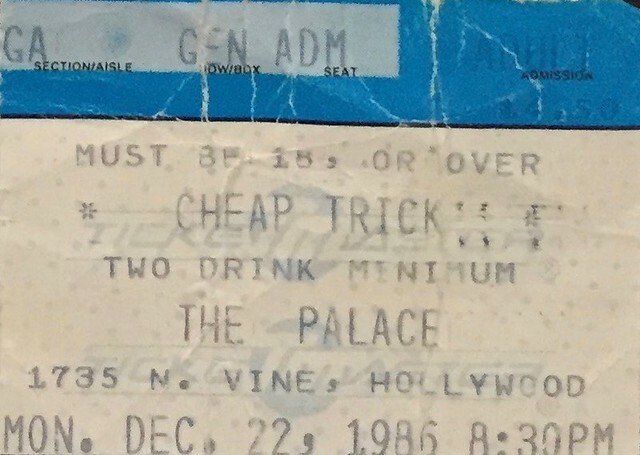 Cheap Trick on 12-22-1986 at The Palace in Hollywood, California. Cost $14.50. Do you have any poison passes ?? I don’t think so on the Poison passes…but I do have some Sunset Strip Poison flyers that I hope to get up soon. Thanks!